Nestled between the northern tip of the Ko'olau Mountain Range and the beautiful Pacific Ocean is a gem of a school. 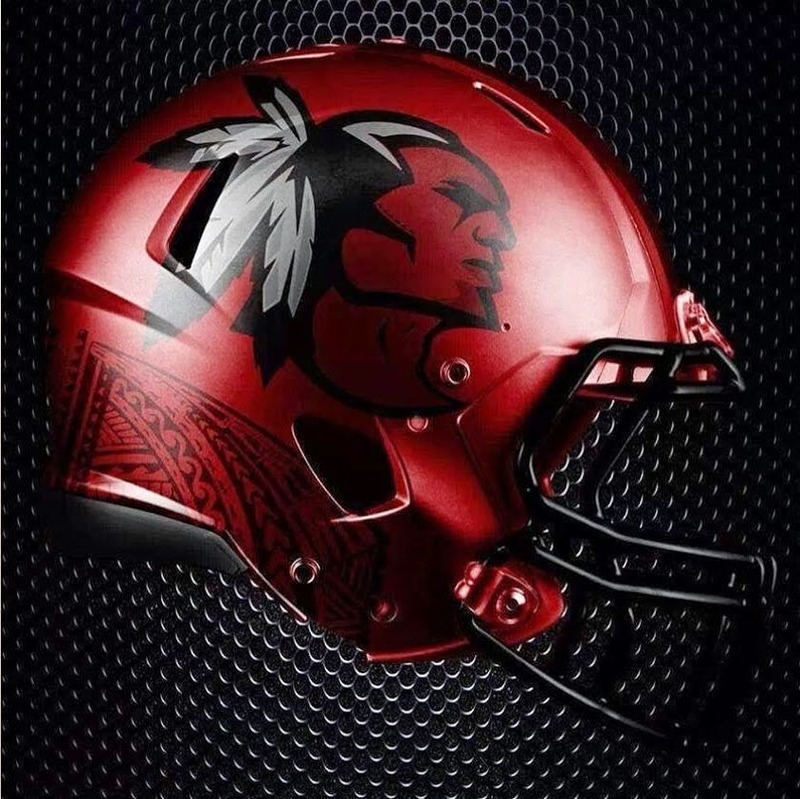 Dubbed the Pride of the North Shore since the late 70's and featuring a menehune mascot, Kahuku High and Intermediate School was a central fixture of the north eastern tip of O'ahu. This school once served elementary students, as well, until it was necessary to separate from the High School because of the exploding population. Our Marching Band in the late 70's, into the 80's, and on until Mr. Michael Payton retired truly exemplified THE PRIDE OF THE NORTH SHORE. Our band was invited to the Rose Bowl every year to march in their parade. They did complicated choreography for half time shows. The band featured brass and winds and percussion instruments, exciting co-drum majors, color guards, and rifle units. It was a most exciting time to sit in the stands of a Kahuku game. For some backwards reason, the home team sat nearest the band room in the small little stands beneath the announcers for the football games. As a child, I would stand at the foot of the large light lamp near the band room to admire the marching band with their beautiful uniforms and costumes that were mostly black, red, and silver. In the late 80's the mascot went from a menehune to an Indian head and now has evolved to a more modern take on an Indian head. The 1989 football season brought THE HOUSE OF PAIN shed, conveniently located toward the mauka endzone on the Red Raider side of the field. The red words were painted on the white surface of the shed and instantly instilled fear in all its opponents. A year or two after the painting, the Oahu Interscholastic Association forced the Red Raiders to take it down citing the psychological effects of the words... or at least that's the story that lives in local legend. ESPN visited in the early 2000's. They did a special on our little school and the Red Raider tradition of football. At one point, Kahuku was tied with three other high schools for having the most players in the NFL at one time. Itula Mili, Chris Nae'ole, Aaron Francisco, and the Kemoeatu brothers. How could this little school in the middle of the Pacific with a beat-up track and a beat-up football field produce such great athletes? Though I did play volleyball for Kahuku, freshman year, my claim to fame was shot put and discus. I often won the MVP award and made the State All-Stars team every year. No one knows my accomplishments because Track is under the radar at Kahuku. Track & Field is thought of as a mandatory-but-not-mandatory spring practice for football players. The Honolulu Advertiser even featured a picture of me in action. The picture was so crimz! One of the funniest things I remember happened my Senior Year at the State Track and Field meet on Maui. I was so bummed that I couldn't participate in May Day because it was the same time as the meet. I begged my dad to let me fly home for May Day then come back to the meet but he said no. So I decided to make the best of my time at States. The shot put event consists of one person in a ring, throwing an 8# ball into a field, as far as possible. The ring is a fixed, set size with a toe board separating the thrower from the field. So there I am in my 2nd or 3rd attempt in the State Finals. You get three tries. I get into the ring. Silence all around me. The lights of the field are bright, the Maui wind's in my favor. Nothing was going to break me. I face the back of the ring, nestle the shot put into my neck, get into the proper stance. The suspense is building for all the on-lookers and I am shivering with nerves. I know my father is watching from the stands, with his binoculars. My right foot is bent, my left leg stretched out behind me. I kick back with my left leg, slide, turn around and my right foot hits the toe-board. It's supposed to hit the toe-board to stop the momentum, however this time... the momentum was too much and DID NOT stop me from my forward progression. Instead, the toe board tripped me and I went flying into the dirt field and the umpire yells, "SCRATCH!" I think the umpire was expecting me to cry but I sat there and laughed, hysterically. Even now, it makes me laugh when I think of how ungraceful I was with my body but accepted my embarrassment with class and took the Gold medal in 1993. This brings me to my point. Inside the heart of every Red Raider boy and girl lies the heart of a champion. There is no need for approval from the world. There is no need for recognition. There is no need for permission to wear my pride like a badge. I don't need the accolades of my peers because what I did as a Lady Raider was for my family and for all the Red Raiders that preceded me. If I fall, I get up and keep going. What we do as Lady Raiders is a gift to all the little Red Raiders that are admiring us. We come from the best stock. We come from a tradition of being the best champions, the best winners, the classiest losers. And what we have more than anyone else in this entire state is HEART. When the going gets tough and we're faced with looming defeat, and we have to dig deep to win, all we have is our HEART. All you have right now is HEART to pull you together, to pull you up, to separate you from the rest of the State that wants to see you fail. You are what the next generation wants to be. The responsibility is upon your shoulders to show your HEART. This is the community we have that stands behind everything we do. Whether we were born and raised in the community or transplants, we are who we are because of all this HEART! This is our fan base! This is what stands with you! The Red Raider pride and glory is certainly infectious. I love that you wrote about the band. Even when living in the South and the seriousness of the marching bands there.. I'm all like "But did your high school go to the Rose Bowl all the time?" and that ends the conversation. I love that we take pride in ALL things Kahuku. From football to marching band, yearbook to chess club, tennis to swimming, homecoming dance to graduations - it's just win or lose and we choose to win.